A priest of the Antiochian Orthodox Archdiocese, Fr. 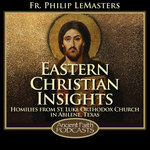 Philip LeMasters is the pastor of St. Luke Orthodox Church, Abilene, TX. He works full-time as Professor of Religion and Director of the Honors Program at McMurry University. He also serves as the Corporate Secretary of the Board of Trustees at St. Vladimir’s Theological Seminary. A native Texan and graduate of both Baylor and Rice, Fr. Philip holds a Ph.D. in Christian Theology and Ethics from Duke University. The author of several books, essays, and reviews, his scholarly work focuses on moral and social questions in Orthodoxy, such as war, peacemaking, marriage, poverty, and medical ethics. Fr. Philip grew up a Southern Baptist, did some denominational wandering, and embraced the Orthodox faith in 2000 together with his wife and two daughters. 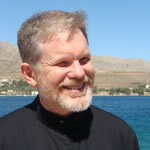 He blogs at http://blogs.ancientfaith.com/easternchristianinsights. He also enjoys cooking, eating, exercising, and naming the stray cats along the creek behind his home.